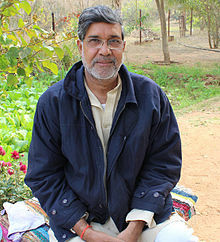 Kailash Satyarthi (born 11 Januar 1954) is an Indian childer's richts activist an a Nobel Peace Prize Laureate. ↑ 1.0 1.1 P.J. George. "Malala, Kailash Satyarthi win Nobel Peace Prize". The Hindu. This page wis last eeditit on 12 Januar 2017, at 21:21.